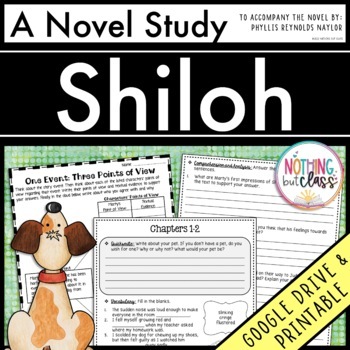 This 107 page book study for Shiloh, by Phyllis Reynolds Naylor, contains comprehension by chapter, vocabulary challenges, creative reading response activities and projects, tests, and much more! You will find this literature guide to be teacher and student friendly. 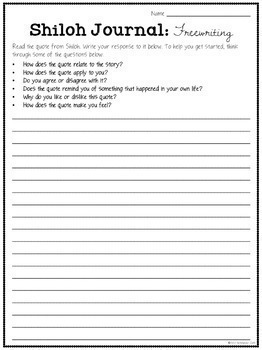 It contains a wide variety of question types, along with open-ended graphic organizers and unique activities, all carefully crafted for this particular story. 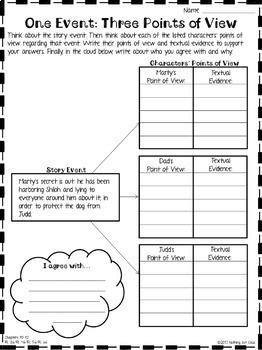 Focus standards include figurative language, character analysis, theme, plot, point of view, and opinion writing. This complete book unit requires very little preparation on your part. Included is a unit map that lays everything out for you. Perfect for whole class, small group, or independent study! ♥BONUS digital version included, which works with Google Drive and contains eye-catching color versions of all resources. ♥Use the paper or the digital version; BOTH are included with your purchase! •Each section covers 1-2 chapters and contains the following 6 parts. →Quickwrite: Warms up student brains before reading. →2 sets of True/False, Sequencing, and/or Multiple Choice questions. →Standards Focus: an activity focused on Reading Literature standards. →Comprehension and Analysis: 3 short answer questions. →Vocabulary: Practice with 3 new words for each section of reading. →Beyond: Creative activity that might include art, brainstorming, or writing. →Please note that MANY resources are included in this study. This is so that teachers may pick and choose what they want to use, since no two classrooms are alike. This is also so that teachers may differentiate for different groups within their classrooms. If you do not wish to purchase the entire big unit with everything included, please check out some of the links below for smaller portions of this complete novel study. NOTE: For the digital version, you will need Internet access and a free Google account. It will work on computers or iPads. (To use it on an iPad, simply have your students download the Google Slides app, available for free on iTunes.) Then, upon purchasing, you will receive a secret link to the digital file, along with explicit, easy-to-follow instructions that will get you started in minutes! Students will be highly engaged and freshly invigorated as they type, draw, and diagram directly into the file on their computers or tablets. They can easily share their work with you as they go, all without the hassle of paper, pencil, and copies. This complete novel study is the best value for your money! However, if you are interested in only individual components from the complete novel study, click on the links below. PLEASE NOTE: the following listings do NOT include Google versions. The Google feature is available with the complete novel study only.